StrandVision Digital Signage now offers a free digital signage trivia content library for its electronic signage customers. Subscribers can select topics that are randomly presented as either "factoid" statements and/or trivia questions. StrandVision's prepared trivia questions and factoids help make the wait worthwhile with mind game diversions that engage viewers and draw attention to the digital media player presentations. StrandVision Digital Signage today announced that it is adding a new, no-cost, trivia library to its electronic signage offerings. The trivia is organized by topics, such as sports, food, animals, plants, hobbies - scores of different categories - and randomly presented as either "factoid" statements and/or trivia questions. "We're offering hundreds of prepared trivia questions and factoids to help make the wait worthwhile for viewers of our customers' StrandVision Digital Signage networks," commented Mike Strand, StrandVision founder and CEO. "These little mind game diversions engage viewers, draw the StrandVision Digital Signage presentations into conversations of waiting customers or employees and enhance overall message delivery." 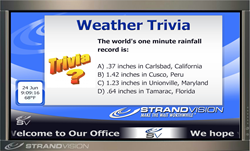 StrandVision customers can add trivia pages to their electronic signage mix with a few clicks. Administrators simply select the presentation format and topics to display and StrandVision cloud servers handle the rest. The trivia is presented as either a statement or as a multiple choice question that offers the answers and then, every few seconds, removes one of the incorrect answers until only the correct response is ultimately displayed. The trivia pages are interspersed with the regular signage content according to an administrator-defined frequency. Topics and formats can easily be added or changed at any time. This free digital signage trivia feature joins a number of StrandVision-provided content streams that add to the digital signage viewing experience. Other content streams include: background music, famous artwork, news and weather with radar, as well as industry-specific feeds, such as banking videos. StrandVision Digital Signage also accepts and processes customer-specified Web pages and RSS feeds to offer virtually unlimited information sources. "We're having fun with this one by learning lots of new random things to babble about at the retirement home. We're sure that our subscribers and their viewers will enjoy it too - although they stand the risk of being the know-it-all at cocktail parties," joked Strand. The no-cost trivia pages are available immediately to StrandVision subscribers. The feature has been added as a new page type in the "Modify Pages" section of their Content Management System (CMS) portal. StrandVision LLC, based in Menomonie, Wis., delivers low-cost, cloud-based digital signage software content to subscribers' digital media player displays, as well as computer screens, websites and mobile devices. StrandVision's patented approach distributes customer created text, graphics videos, rss/social media feeds along with pre-packaged worldwide, national and local weather and news. It is ideal for many business marketing applications for waiting rooms (patient and customer information); banks and retailers (video merchandising); education (student, staff and visitor information); business and industrial settings (employee communication and operational/performance information); nonprofit and religious organizations (member and supporter communication). StrandVision also offers supporting digital signage hardware including PC-2-TV.net, a fully digital, high-definition (HD) video extender for long distance multi-screen distribution, linux digital media players to ease and optimize electronic signage network installation and several large-format displays including freestanding pedestal displays. StrandVision Digital Signage services, installation and equipment are available directly from StrandVision and through registered affiliates and system integrators. Additional information about StrandVision Digital Signage is available at StrandVision.com, 715-235-7446 or by email.